Nakivo has announced the newer version of their Backup and Replication solutions. Nakivo is continuously adding more and more features to their Backup solution. In this post we will see on what main features are announced in the Nakivo 8.1 Backup & Replication. Policy Based Protection is quite simple but more useful feature for the day to day life, where once you have configured policies VMs will be automatically protected by the Nakivo Backup. You don’t have to manually add those VMs in to Nakivo. You can configure policies based on VM name, tag, size, location, VM configuration, power state, or any combination of these parameters whichever you required. As the name says Universal Object Recovery, it allows you to recover any object in your infrastructure – whatever the application or file system – in a matter of minutes. 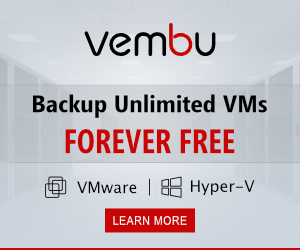 Simply mount the most recent backup to a VM and then recover the necessary data using the native application tools. It is very useful when you lose any of your application or database data , so that with this feature you can easily recovery any objects. New Version of Nakivo comes with the Added security of SSL so that now you have secured HTTPS connection while accessing Nakivo Backup & Replication. What’s New in Nakivo 8.1 ?